The Mercator projection is a conformal, nonperspective projection; it is constructed by means of a mathematical transformation and cannot be obtained directly by graphical means. 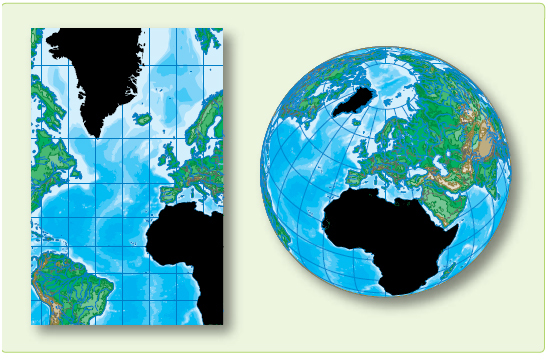 The distinguishing feature of the Mercator projection among cylindrical projections is: At any latitude the ratio of expansion of both meridians and parallels is the same, thus, preserving the relationship existing on the earth. This expansion is equal to the secant of the latitude, with a small correction for the ellipticity of the earth. Since expansion is the same in all directions and since all directions and all angles are correctly represented, the projection is conformal. Measuring large distances accurately is difficult. Must apply conversion angle to great circle bearing before plotting. Is useless above 80° N or below 80° S since the poles cannot be shown. Figure 1-23. Mercator is conformal but not equal area. The transverse or inverse Mercator is a conformal map designed for areas not covered by the equatorial Mercator. With the transverse Mercator, the property of straight meridians and parallels is lost, and the rhumb line is no longer represented by a straight line. The parallels and meridians become complex curves and, with geographic reference, the transverse Mercator is difficult to use as a plotting chart. The transverse Mercator, though often considered analogous to a projection onto a cylinder, is in reality a nonperspective projection, constructed mathematically. 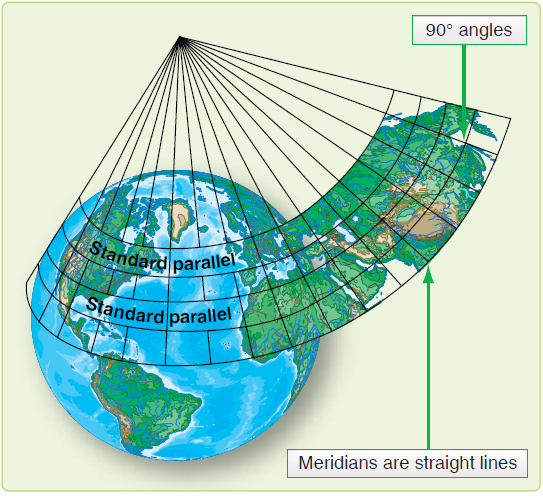 This analogy, however, does permit the reader to visualize that the transverse Mercator shows scale correctly along the central meridian, which forms the great circle of tangency. [Figure 1-24] In effect, the cylinder has been turned 90° from its position for the ordinary Mercator, and a meridian, called the central meridian, becomes the tangential great circle. 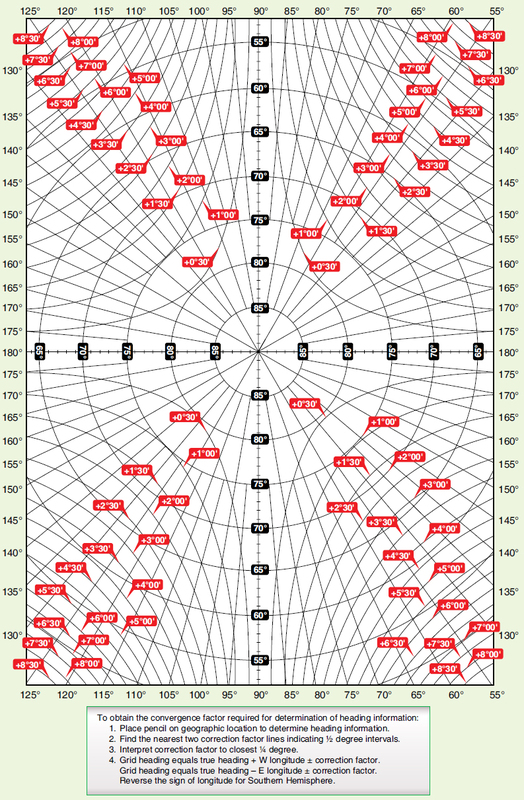 One series of NGA charts using this type of projection places the cylinder tangent to the 90° E–90° W longitude. These projections use a fictitious graticule similar to, but offset from, the familiar network of meridians and parallels. The tangent great circle is the fictitious equator. Ninety degrees from it are two fictitious poles. A group of great circles through these poles and perpendicular to the tangent constitutes the fictitious meridians, while a series of lines parallel to the plane of the tangent great circle forms the fictitious parallels. On these projections, the fictitious graticule appears as the geographical one ordinarily appearing on the equatorial Mercator. That is, the fictitious meridians and parallels are straight lines perpendicular to each other. The actual meridians and parallels appear as curved lines, except the line of tangency. Geographical coordinates are usually expressed in terms of the conventional graticule. A straight line on the transverse Mercator projection makes the same angle with all fictitious meridians, but not with the terrestrial meridians. It is, therefore, a fictitious rhumb line. 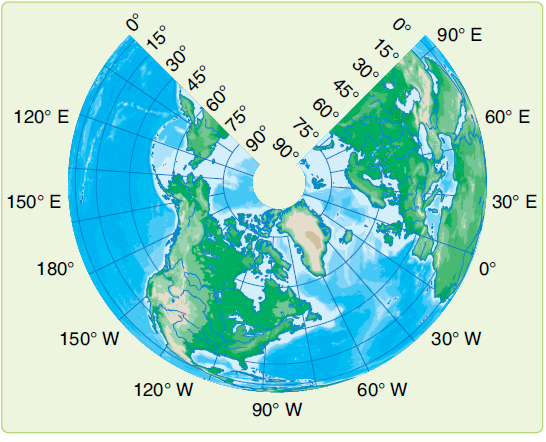 The appearance of a transverse Mercator using the 90° E–90° W meridian as a reference or fictitious equator is shown in Figure 1-24. The dotted lines are the lines of the fictitious projection. The N–S meridian through the center is the fictitious equator, and all other original meridians are now curves concave on the N–S meridian with the original parallels now being curves concave to the nearer pole. To straighten the meridians, use the graph in Figure 1-25 to extract a correction factor that mathematically straightens the longitudes. There are two classes of conic projections. 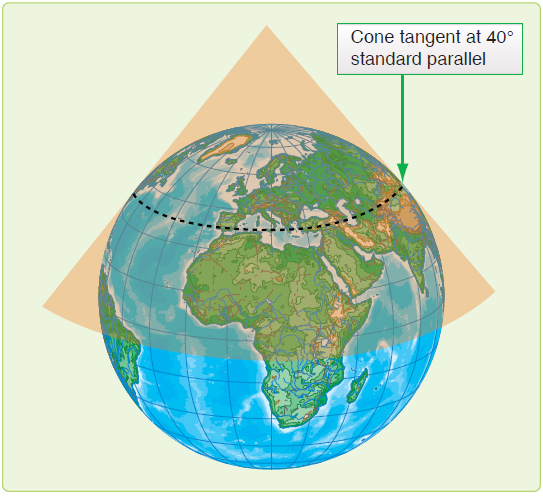 The first is a simple conic projection constructed by placing the apex of the cone over some part of the earth (usually the pole) with the cone tangent to a parallel called the standard parallel and projecting the graticule of the reduced earth onto the cone. [Figure 1-26] The chart is obtained by cutting the cone along some meridian and unrolling it to form a flat surface. Notice, in Figure 1-27, the characteristic gap appears when the cone is unrolled. The second is a secant cone, cutting through the earth and actually contacting the surface at two standard parallels as shown in Figure 1-28. Figure 1-26. Simple conic projection. Figure 1-27. Simple conic projection of northern hemisphere. Figure 1-28. Conic projection using secant cone. The Lambert conformal conic projection is of the conical type in which the meridians are straight lines that meet at a common point beyond the limits of the chart and parallels are concentric circles, the center of each being the point of intersection of the meridians. Meridians and parallels intersect at right angles. Angles formed by any two lines or curves on the earth’s surface are correctly represented. The projection may be developed by either the graphic or mathematical method. It employs a secant cone intersecting the spheroid at two parallels of latitude, called the standard parallels, of the area to be represented. The standard parallels are represented at exact scale. Between these parallels, the scale factor is less than unity and, beyond them, greater than unity. For equal distribution of scale error (within and beyond the standard parallels), the standard parallels are selected at one-sixth and five-sixths of the total length of the segment of the central meridian represented. The development of the Lambert conformal conic projection is shown by Figure 1-29. Figure 1-29. Lambert conformal conic projection. Great circles are approximated by straight lines (actually concave toward the midparallel). For areas of small latitudinal width, scale is nearly constant. For example, the United States may be mapped with standard parallels at 33° N and 45° N with a scale error of only 2 percent for southern Florida. The maximum scale error between 30°30′ N and 47°30′ N is only one-half of 1 percent. Positions are easily plotted and read in terms of latitude and longitude. Construction is relatively simple. Its two standard parallels give it two lines of strength (lines along which elements are represented true to shape and scale). Distance may be measured quite accurately. For example, the distance from Pittsburgh to Istanbul is 5,277 NM; distance as measured by the graphic scale on a Lambert projection (standard parallels 36° N and 54° N) without application of the scale factor is 5,258 NM; an error of less than 0.4 percent. Rhumb lines are curved lines that cannot be plotted accurately. Maximum scale increases as latitudinal width increases. Parallels are curved lines (arcs of concentric circles). Continuity of conformality ceases at the junction of two bands, even though each is conformal. If both have the same scale along their standard parallels, the common parallel (junction) has a different radius for each band and does not join perfectly. Most conic charts have the constant of the cone (convergence factor) computed and listed on the chart somewhere in the chart margin. 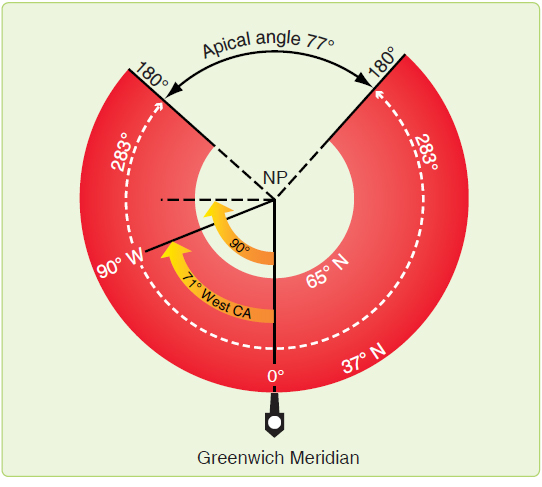 The convergence angle (CA) is the actual angle on a chart formed by the intersection of the Greenwich meridian and another meridian; the pole serves as the vertex of the angle. CAs, like longitudes, are measured east and west from the Greenwich meridian. A chart’s convergence factor (CF) is a decimal number that expresses the ratio between meridional convergence as it actually exists on the earth and as it is portrayed on the chart. When the CA equals the number of the selected meridian, the chart CF is 1.0. When the CA is less than the number of the selected meridian, the chart CF is proportionately less than 1.0. 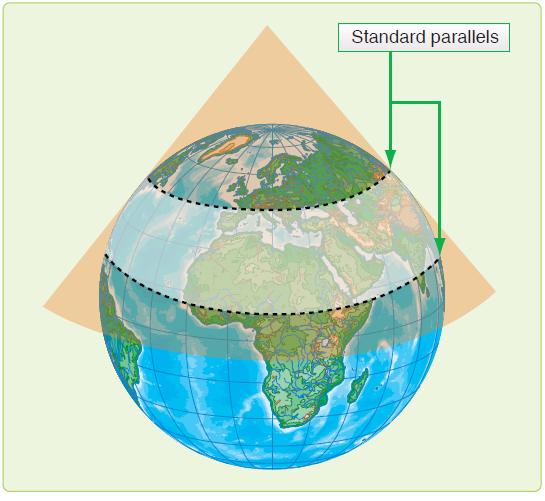 The subpolar projection illustrated in Figure 1-30 portrays the standard parallels, 37° N and 65° N. It presents 360° of the earth’s surface on 282.726° of paper. Therefore, the chart has a CF of 0.78535 (282.726° divided by 360° equals 0.78535). Meridian 90° W forms a west CA of 71° with the Greenwich meridian. Figure 1-30. A Lambert Conformal, convergence factor 0.78535. Approximate a chart’s CF on subpolar charts by drawing a straight line covering 10 lines of longitude and measuring the true course at each end of the line, noting the difference between them, and dividing the difference by 10. NOTE: The quotient represents the chart’s CF.